Two weeks ago a disk of my Hetzner root server was slowly degrading. I asked for an exchange, got the go from Hetzner support, removed the disk from RAID1. 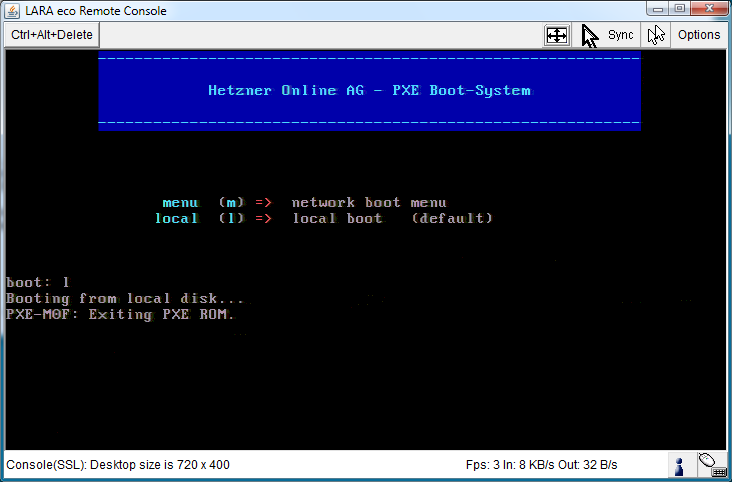 Hetzner installed a new disk and booted up. I added the disk to the RAID, resync, done. 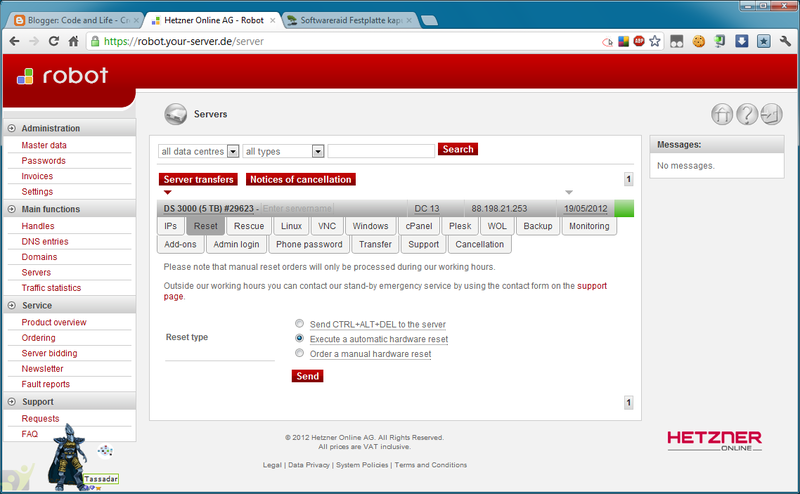 Two weeks later the server just disappeard from the net with all services. No connection possible on any port. No idea, if the earlier disk change was related to this problem. I suppose it was. 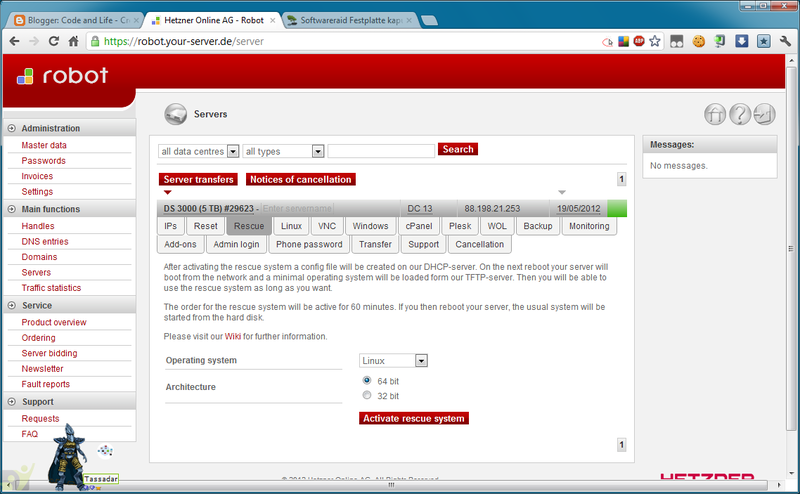 Log in to the Hetzner management site (https://robot.your-server.de/) and enable the rescue-system. Then request an automatic hardware reset. Connect to the server, log in as root. This means, there is no hardware problem and no persistent routing problem. Asked Hetzner support to attach a LARA remote console. The console shows the local screen output and accepts keyboard input. It is even possible to re-configure the BIOS. Since the disks were found, it must be a problem on the disk. Maybe the bootloader is broken. Request the rescue-system and then a hardware-reset. Connect to the rescue system. Possible to mount the RAID? Shows some (many) errors. Fixed them by staying on the "y" key. Could use the auto repair option of fsck (-y). This is a Hetzner installimage-setup, so there should be a grub bootloader. Check for the /boot/grub/ folder. Again mount the RAID. It is there, so there is a good chance, that the bootloader is grub, not lilo. Now re-install grub on the disk. Actually on both disks, just in case one is missing. Install the bootloader on both partitions. Both are regarded as hd0 from the point of view of the bootloader at boot time. Running "embed /boot/grub/e2fs_stage1_5 (hd0)"... 17 sectors are embedded. with the command setup (hd0) in grub you are telling the installer tool to install the boot environment into the Master Boot Record (MBR) of your first hard disc. However, the syncing via raid1 is performed on partition level, i.e. only the data on /dev/sda1 (or whatever partition) is being copied to the new disk. Or said a bit differently: the MBR is not affected by your sync activities.